Агробактерії як потенційні продуценти магніточутливих наноструктур | Наукові вісті НТУУ "КПІ"
Виявлено гомологи білків синтезу магнетиту групи Mam Magnetospirillum gryphiswaldense MSR-1 у протеомі агробактерій (АБ) та їх рослин-господарів. Ідентифікацію білків-гомологів здійснювали через проведення попарних вирівнювань за допомогою онлайн-ресурсу BLAST-NCBI. Встановлено, що штами симбіотичних і патогенних АБ, здатних до формування бульбочок коренів рослин, та їх типові рослини-господарі містять гомологи білків, без яких неможлива біомінералізація біогенних магнітних наночастинок у магнітотаксисних бактерій – MamВ, MamМ, MamЕ та MamО. І показано, що гомологи кожного з білків мають спільного предка, подібний фолдинг, однакові функції з відповідними білками магнітотаксисних бактерій. Таким чином, симбіотичні та патогенні АБ, а також рослини-господарі можуть бути потенційними продуцентами біогенних магнітних наночастинок або магніточутливих наноструктур. С. 26–32., Табл. 1. Бібліогр. : 26 назв. 1. I.E. Dodueva et al., “Plant Tumorigenesis: Different Ways for Shifting Systemic Control of Plant Cell Division and Differentiation”, Transgenic Plant Journal, vol. 1(1), pp. 17—38, 2007. 2. T. Tzfira and V. Citovsky, Eds., Agrobacterium: From Biology to Biotechnology. New York: Springer, 2008, 735 p.
3. P.M. Merritt et al., “Motility and chemotaxis in Agrobacterium tumefaciens surface attachment and biofilm formation”, J. of Bacteriol., vol. 189, no. 22, рp. 8005— 8014, 2007. 4. J. Prell and P. Poole, “Metabolic changes of rhizobia in legume nodules”, Trends in Microbiol., vol. 14, no. 4, рp. 161—168, 2006. 5. D. Amelia et al., “Mechanisms and Regulation of Polar Surface Attachment in Agrobacterium tumefaciens”, Curr. Opin. Microbiol, vol. 12(6), рp. 708—714, December 2009. 6. A.C. Braun, “Stages in the life history of Phytomonas tumefaciens”, J. Bacteriol., no. 52, рp. 695—702, 1946. 7. M. Janczarek, “Environmental Signals and Regulatory Pathways That Influence”, Int. J. Mol. Sci., vol. 12, рp. 7898—7933, 2011. 8. W.S. Wu, “The signaling mechanism of ROS in tumor progression”, Cancer Metastasis Rev., vol. 25(4), pp. 695— 705, 2006. 9. V.F. Chekhun et al., “Magnetic nanostructures in tumour cells”, Research bulletin of the National Academy of Sciences of Ukraine, no. 9, 2011. 10. V.F. Chekhun et al., “Magnetically ordered nanostructures of endogenous origin in Erlich carcinoma cells”, Nanostructural science of materials (Ukrainian Journal), no. 2, 2011. 11. Yu.I. Gorobets and S.V. Gorobets, “Stationary flows of electrolytes in the vicinity of ferromagnetic particles in a constant magnetic field”, Bulletin of Kherson State Technical University (Ukrainian Journal), vol. 3(9), pp. 276—281, 2000. 12. Y.-X. Jing et al., “Effect of magnetic field on symbiotic nitrogen fixation of soybean nodules”, Acta Botanica Sinica, vol. 34, no. 5, pp. 364—368, 1992. 13. R. Bajwa et al., “Effect of electromagnetism on nodulation, vesicular arbuscular mycorrhizal infection and top growth of chickpea. I. Response of electromagnetized rhizobium”, J. of Phytopathology, vol. 7(1), pp. 76—77, 1995. 14. M.B. Vainshtein et al., “A new type of magnetosensitive inclusions in cells of photosynthetic purple bacteria”, Syst. Appl. Microbiol, no. 20, pp. 182—186, 1997. 15. A. Komeili, “Molecular Mechanisms of Compartmentalization and Biomineralization in Magnetotactic Bacteria”, FEMS Microbiol Rev., vol. 36(1), pp. 232—255, 2012. 16. D. Schuler, “Genetics and cell biology of magnetosome formation in magnetotactic bacteria, FEMS Microbiol. Rev., vol. 32, pp. 654—672, 2008. 18. W. Li et al., “Saturated BLAST: an automated multiple intermediate sequence search used to detect distant homology”, Bioinformatics, vol. 16, no. 12, pp. 1105— 1110, 2000. 19. D. Schuler, “Characterization of the magnetosome membrane in Magnetospirillum gryphiswaldense”, in Biomineralization of nano- and microstructures. Ch. 8, E. Bauerlein, Ed. Weinheim: Wiley-VCH, 2000, pp. 109—118. 20. A. Komeili et al., “Magnetosome vesicles are present before magnetite formation, and MamA is required for their activation”, PNAS, vol. 101, no. 11, pp. 3839—3844, 2004. 21. Uniprot [Online]. Available: http://www.uniprot.org/ uniprot/ F6EAD5 22. B.Z. Harris and W.A. Lim, “Mechanism and role of PDZ domains in signaling complex assembly”, J. of Cell Science, vol. 114, pp. 3219—3231, 2011. 23. W. Yang et al., “mamO and mamE genes are essential for magnetosome crystal biomineralization in Magnetospirillum gryphiswaldense MSR-1”, Res. Microbiol., vol. 161, no. 8, pp. 701—705, 2010. 24. W. Yang et al., “Magnetosomes eliminate intracellular reactive oxygen species in Magnetospirillum gryphiswaldense MSR-1”, Environ. Microbiol., vol. 14, is. 7, pp. 1722—1729, 2012. 25. Gorobets O.Yu. et al., “Biogenic Magnetic Nanoparticles: Biomineralization in Prokaryotes and Eukaryotes”, Accepted for publication in Dekker Encyclopedia of Nanoscience and Nanotechnology, 3rd ed., 2014. 26. Чехун В.Ф., Горобець С.В., Горобець О.Ю. та ін. Маг- ніточутливі наноструктури ендогенного походження у клітинах карциноми Ерліха // Наноструктурное ма- териаловед. — 2011. — № 2. — C. 102—109. 1. I.E. Dodueva et al., “Plant Tumorigenesis: Different Ways for Shifting Systemic Control of Plant Cell Division and Differentiation”, Transgenic Plant Journal, vol. 1(1), pp. 17–38, 2007. 2. T. Tzfira and V. Citovsky, Eds., Agrobacterium: From Biolo¬gy to Biotechnology. New York: Springer, 2008, 735 p.
3. P.M. Merritt et al., “Motility and chemotaxis in Agrobacterium tumefaciens surface attachment and biofilm formation”, J. of Bacteriol., vol. 189, no. 22, рp. 8005–8014, 2007. 4. J. Prell and P. Poole, “Metabolic changes of rhizobia in legume nodules”, Trends in Microbiol., vol. 14, no. 4, рp. 161–168, 2006. 5. D. Amelia et al., “Mechanisms and Regulation of Polar Surface Attachment in Agrobacterium tumefaciens”, Curr. Opin. Microbiol, vol. 12(6), рp. 708–714, Decem¬ber 2009. 6. A.C. Braun, “Stages in the life history of Phytomonas tumefaciens”, J. Bacteriol., no. 52, рp. 695–702, 1946. 7. M. Janczarek, “Environmental Signals and Regulatory Pathways That Influence”, Int. J. Mol. 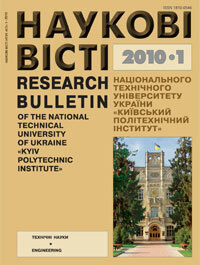 Sci., vol. 12, рp. 7898–7933, 2011. 8. W.S. Wu, “The signaling mechanism of ROS in tumor progression”, Cancer Metastasis Rev., vol. 25(4), pp. 695–705, 2006. 9. V.F. Chekhun et al., “Magnetic nanostructures in tumour cells”, Research bulletin of the National Academy of Sciences of Ukraine, no. 9, 2011. 10. V.F. Chekhun et al., “Magnetically ordered nanostruc¬tures of endogenous origin in Erlich carcinoma cells”, Nanostructural science of materials (Ukrainian Journal), no. 2, 2011. 11. Yu.I. Gorobets and S.V. Gorobets, “Stationary flows of electrolytes in the vicinity of ferromagnetic particles in a constant magnetic field”, Bulletin of Kherson State Technical University (Ukrainian Journal), vol. 3(9), pp. 276–281, 2000. 12. Y.-X. Jing et al., “Effect of magnetic field on symbiotic nitrogen fixation of soybean nodules”, Acta Botanica Sinica, vol. 34, no. 5, pp. 364–368, 1992. 13. R. Bajwa et al., “Effect of electromagnetism on nodu¬lation, vesicular arbuscular mycorrhizal infection and top growth of chickpea. I. Response of electromagnetized rhizobium”, J. of Phytopathology, vol. 7(1), pp. 76–77, 1995. 14. M.B. Vainshtein et al., “A new type of magnetosensitive inclusions in cells of photosynthetic purple bacteria”, Syst. Appl. Microbiol, no. 20, pp. 182–186, 1997. 15. A. Komeili, “Molecular Mechanisms of Compartmen¬talization and Biomineralization in Magnetotactic Bacte¬ria”, FEMS Microbiol Rev., vol. 36(1), pp. 232–255, 2012. 16. D. Schuler, “Genetics and cell biology of magnetosome formation in magnetotactic bacteria, FEMS Microbiol. Rev., vol. 32, pp. 654–672, 2008. 18. W. Li et al., “Saturated BLAST: an automated multiple intermediate sequence search used to detect distant homology”, Bioinformatics, vol. 16, no. 12, pp. 1105–1110, 2000. 19. D. Schüler, “Characterization of the magnetosome mem¬brane in Magnetospirillum gryphiswaldense”, in Biomi¬neralization of nano- and microstructures. Ch. 8, E. Bäu-erlein, Ed. Weinheim: Wiley-VCH, 2000, pp. 109–118. 20. A. Komeili et al., “Magnetosome vesicles are present be¬fore magnetite formation, and MamA is required for their activation”, PNAS, vol. 101, no. 11, pp. 3839–3844, 2004. 22. B.Z. Harris and W.A. Lim, “Mechanism and role of PDZ domains in signaling complex assembly”, J. of Cell Science, vol. 114, pp. 3219–3231, 2011. 23. W. Yang et al., “mamO and mamE genes are essential for magnetosome crystal biomineralization in Magnetospiri¬llum gryphiswaldense MSR-1”, Res. Microbiol., vol. 161, no. 8, pp. 701–705, 2010. 24. W. Yang et al., “Magnetosomes eliminate intracellular reactive oxygen species in Magnetospirillum gryphiswal¬dense MSR-1”, Environ. Microbiol., vol. 14, is. 7, pp. 1722–1729, 2012. 25. Gorobets O.Yu. et al., “Biogenic Magnetic Nanoparticles: Biomineralization in Prokaryotes and Eukaryotes”, Accepted for publication in Dekker Encyclopedia of Nanoscience and Nanotechnology, 3rd ed., 2014. 26. Chekhun V.F., Horobet͡s′ S.V., Horobet͡s′ O.I͡u. ta in. Mahnitochutlyvi nanostruktury endohennoho pokhodz͡henni͡a u klitynakh kart͡synomy Erlikha // Nanostrukturnoe materyaloved. – 2011. – # 2. – S. 102–109.